Pt. I: Fact and Fantasy explains universal library organization, fiction and nonfiction, the Dewey Decimal system, and the librarian as a special resource. (14 min.) A Meridian Production. Pt. II: Research and Reference details the card catalog system for books and audiovisual materials, newspapers, magazines, references, and periodicals. (14 min.) A Meridian Production. ACT Together II is a twenty-minute video which is part of the series, Get Your ACT Together.This video series provides comprehensive preparation for taking the ACT in two entertaining programs that have been updated to reflect the changes in the ACT Test. Part I begins with a dramatization of the worst ACT test taking experience in history. This video goes on to show how to avoid the pitfalls of standardized tests, presents specific test-taking strategies, and illustrates how to overcome test-taking anxiety (performance anxiety). This first part also explains each section of the test, time limits, and scoring. Common student questions are answered concisely, including "Should I guess?" "What do I do if I run out of time?" and "What should I do to prepare myself for the ACT?" Part II discusses the topics covered in sections of the ACT. One 20-minute video.A Cambridge Educational Production. ACT Together I is a twenty-minute video which is part of the series, Get Your ACT Together.This video series provides comprehensive preparation for taking the ACT in two entertaining programs that have been updated to reflect the changes in the ACT Test. Part I begins with a dramatization of the worst ACT test taking experience in history. This video goes on to show how to avoid the pitfalls of standardized tests, presents specific test-taking strategies, and illustrates how to overcome test-taking anxiety (performance anxiety). This first part also explains each section of the test, time limits, and scoring. Common student questions are answered concisely, including "Should I guess?" "What do I do if I run out of time?" and "What should I do to prepare myself for the ACT?" Part II discusses the topics covered in sections of the ACT. One 20-minute video.A Cambridge Educational Production. For many students, the mere thought of taking a test sends adrenaline running throughout their bodies, brings perspiration to their brows, and causes them to suddenly forget everything they have learned. 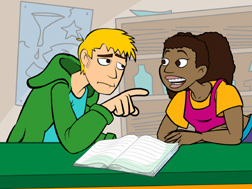 This humorous and informative video teaches students the art of stress-free test-taking. Students learn how to put test-taking into its proper perspective and realize that although tests are important, they are simply a way to measure one's knowledge of a subject. This is a Test stresses that no gimmick or shortcut can take the place of knowledge and teaches tips for reviewing and retaining information with easy-to-implement, effective study techniques. Students learn how test scores and anxiety levels are affected by preparing, organizing, cramming, and anticipating. Students discover the most effective ways to approach common test formats (multiple choice, standardized, matching, true/false, and essay), the importance of reading questions carefully, and the benefits of preparing themselves physically as well as mentally. A Cambridge Educational Production. One 30-minute video and how-to-study book. Why do we have to learn this? When will I ever use this information once I get out of school? When students acquire the ability to answer these questions for themselves, they develop an improved understanding of their subjects along with the ability to identify and retain pertinent information. This upbeat video teaches students the Empty "V" System which stresses the importance and effectiveness of deciding the purpose of each lesson in order to better understand key information. Students learn proven techniques for studying, reviewing, and retaining information that fit into any lifestyle or class structure. Reading and taking notes becomes easier, more effective, and less time-consuming as students learn how to find key facts and ideas. Study sessions become more efficient as students learn tips for condensing information into memorable formats and the effectiveness of frequently referring to the condensed versions. This important lesson entertains busy, lazy, eager, and reluctant students as they learn to apply the skills that last a lifetime. A Cambridge Educational Production. One 30-minute video and how-to-study book. Students learn how to achieve academic success by learning the study behaviors that lead to high achievement. This video illustrates the importance of developing good skills in the areas of listening, notetaking, and outlining. Emphasis is placed on preparing for classes, paying attention, and developing a positive attitude. Bad academic behaviors are illustrated by one of the worst students in history. Specific suggestions, tips, and techniques are presented to overcome bad habits. The second section shows students how to utilize time at home efficiently, how to set priorities, how to decide which subjects to study first, how long to study each subject, and how to get the most from their texts.A Cambridge Educational Production. One 30-minute video. This video presents techniques for performing well on tests. The first section shows how to prepare for a test, including tips for studying and ways to remember material more effectively. This program also explains what to do on the day of the test to prepare both mentally and physically. The final section of the program covers how to handle different kinds of questions (e.g. essay vs. objective) and how to review for maximum retention. A Cambridge Educational Production. One 25-minute video. This video recognizes the fact that underachievers often fall into a trap with little growth or real movement. While the underachiever may have goals, the goals are too often vague and unrealistic-from their proclamations to become pro-athletes or rock stars to their procrastination and self-defeating academic behavior. Stressing the assistance of a total supportive environment, including guidance from parents and teachers, Breaking Out notes that the underachiever wants the same things all other students want...they simply lack the specific successful academic tools and the day-in, day-out motivation. Breaking Out goes beyond describing the profile of the typical underachiever. It also looks at techniques students, teachers, and parents can use to help them break out of the trap. A Cambridge Educational Production. One 25-minute video. College selection can have a great effect on a student's happiness for a number of years, not to mention influencing future careers. However, rarely is the choice of a college or university made through an organized, rational selection process. This video shows college-bound students how to select a school that is right for them academically, financially, and socially. Students learn many factors they should include in considering schools, including type (public vs. private); size (large, medium, or small); location; community setting; social life; academic quality; academic selection; academic standards; academic majors available; financial aid availability (work study, ROTC, scholarships, etc. ); and more. Emphasis is placed on identifying the criteria that are important to an individual and using an organized selection procedure for narrowing the alternatives. The program also covers the importance of a campus visit in making the final decision. A Cambridge Educational Production.One 35-minute video with manual incorporating reproducible checklists. Tabitha is the best runner on her high school track team. She has learned both physical and mental techniques that help her win long-distance races. But this spunky runner is a mega-procrastinator when it comes to schoolwork. That's all about to change as her best and brainy friends take a closer look at the techniques Tabitha uses to win races and then coach her to apply them academically. Following the Seven Big C's (COMFORT, CHARGE, CALCULATION, COMPREHENSION, CONCENTRATION, COHESION, and CONFIDENCE), Tabitha learns how to Study to Win!This energetic and information-packed video shows students how to get Organized, Make a Study Schedule, Take Excellent Notes in class, and Prepare and Preview Material. Also covered are Chapter Summaries, Writing a Rough Draft, Writing an Outline and Thesis, Memorization Tips, How to Use Association and Visualization, and more. Jam-packed with clever and helpful information, all students will benefit from watching this video, and like Tabitha will learn how to Study to Win!A Cambridge Educational Production. One 30-minute video. This program is a wide-ranging video guide to preparing and presenting social studies projects, including displays, group projects, performances, and media presentations. Highlighted by on-location interviews with students (grades 6-12) and judges at Social Studies Fairs and National History Day contests, the program focuses on how social studies projects help students develop important research, writing, and communication skills. There's also plenty of helpful advice on choosing a topic, following the rules, gathering and organizing data, researching primary and secondary sources, writing a report, constructing a display, and preparing an oral presentation. This unique resource can be used to help students prepare for their first projects, or with more advanced students to promote a better understanding of the process of designing and carrying out successful social studies projects. A Cambridge Educational Production. One 22-minute video. "When I was your age, I..." The truth of the matter is that the parents, grandparents, and even teachers of today's youth were faced with a smaller array of choices than are open to the teenagers of today. This upbeat, powerful video features young people discussing their reasons for dropping out and the vast differences between the expectations and the reality of life after dropping out. Students see the abundance of choices available to them as high school graduates and the depleted job market accessible to dropouts. Look Before You Leap focuses on the choices and alternatives available to all students contemplating dropping out. Vocational schools, part-time work, part-time school, counseling, financial aid, and day care centers for teenage mothers are presented and discussed as alternatives to dropping out. This program also sends an important message to those students who might drop out by emphasizing the importance of having a plan or goals before burning the bridges to education. "Don't just drop out of school. Drop into life." A Cambridge Educational Production. One 30-minute video and workbook. How many students have you seen who could get so much more out of high school if they just spent more time designing a course of study to meet their personal and career goals? This unique program focuses on effectively designing an educational plan for the high school years. Emphasis is placed on carefully selecting high school courses that will provide the vehicle for successfully pursuing future educational and career plans. The first segment emphasizes the importance of planning. In the second segment, types of curricular programs are explained. The final segment illustrates how to design a sound educational plan. A Cambridge Educational Production. One 30-minute video and guide. Libraries...books, periodicals, and a whole lot more. Now introduce your students to the electronic side of the library/media center with this video. The electronic era has opened up an amazing sea of information including computerized card catalogs, web sites, Internet connections, and more. Watch an experienced 6th grader acquaint a 2nd grader with the exciting and fascinating world of the media center. Follow their progress as they review the basic workings of a library: the reference section, fiction and nonfiction area, call letters, and periodicals as well as hooking up with the computerized card catalog to locate information. Experience the electronic capabilities of the Internet and other programs that make exploring and learning fun as our 2nd grader grasps the basics of information at a keystroke. What a great way to introduce students to your library/media center! o Use as an introduction o Use as a review o Use for individual instruction. (Grades 2-6.) (19 min.) A Meridian Production. Ask the average young person what a mentor is and you're likely to get many different answers, IF they are able to answer the question. Many people have heard of mentors, but not many realize they need them, actually have them, and ARE mentors to people around them, no matter the age. We all rely on others for guidance, advice, and direction in our careers, our schooling, and other interests. Plus, not only is the connection important for the recipient, mentors themselves gain a lot from these arrangements. This video investigates the importance of having a mentor and how that relationship can help you grow in ways you might never have considered. Students watching this video learn about the importance of the experienced helping the inexperienced, and what their role is in that relationship. A Meridian Production. One 20-minute video. Androgena the puppet and her real friend Ryan must meet the challenge of preparing a book report about their favorite animal while, at the same time, they are organizing the school carnival. Gaze through the crystal ball of Madam Androgena Know-It-All and see how to research and prepare a report from subject selection to receiving a grade. (Grades K-3.) (13 min.) A Meridian Production. While doing their homework, Ryan and Androgena wonder about how books were invented and how they are produced. Androgena becomes a Super Sleuth as they explore the history of bookmaking. Students will be fascinated to learn all the processes involved with books beginning as trees and ending up on bookshelves. (Grades K-3.) (19 min.) A Meridian Production. Androgena and her Uncle Ron explore every facet of the modern media center from fiction to nonfiction. Learn how to find the reference section, periodicals, multimedia-including CD-ROM, and even search subject or title on the computerized card catalog! This program is an excellent introduction to what reference materials are and how to use them effectively. (Grades K-3. )(12 min.) A Meridian Production. To have a shot at college, students must first believe they can get into college. This program shows the positive things that can happen when the dream of a college education is nurtured in classrooms and communities where expectations previously had been low. By spotlighting innovative approaches for motivating and teaching children-from the Upward Bound initiative in Cleveland that can only serve a few students, to GEAR UP's creation of a college-going culture in a Latino community in Texas, to the efforts of Project GRAD in Atlanta to get all 8th-graders ready to succeed in high school and then in college-the video documents both the rewards of expecting the best and the challenges communities face to ensure that their schools serve all students. (57 minutes) On-demand English subtitles. Can be viewed using a DVD player or computer DVD-ROM drive. Issues of race and class have turned the college experience into an obstacle course that is deterring many of America's brightest students from graduating with a four-year degree. This video counters cultures of low expectation and social isolation with three stand-out initiatives that are helping students get into college-and stay in. Featured in this video are: the Meyerhoff Scholars Program, a national model for talented minority students studying science, engineering, math, and computer science; The Puente Project; the East Los Angeles College program, which bridges the transition gap between two- and four-year institutions; and the Twenty-first Century Scholars Program, which is raising educational aspirations among Indiana's low- and moderate-income families. (57 minutes) On-demand English subtitles. Can be viewed using a DVD player or computer DVD-ROM drive. Media specialists have long been aware of the importance of developing lifetime library patrons-those who use library resources for work and play. This program is a terrific first step in doing just that. The video follows a 13-year-old as she tours the library and discovers paperback books for recreational reading, along with videos, CDs, books-on-tape, and many other fun things that are there for the taking. She also discovers magazines, local newspapers, books on hobbies, and more, all introduced with humor and a "light" touch. The video shows students how to: find Ted Williams' batting average in 1941; find a four-letter word for an extinct bird; and discover the size of the world's biggest pizza. With the help of this video and your complete Teacher's Guide, you can teach your kids that there's more to the media center than just school work. (Grades 4-8.) (26 min.) A Meridian Production. This hard-hitting video shows at-risk teens how difficult their lives will be if they drop out of school. The dropouts interviewed in the video have found that without diplomas they cannot achieve their dreams, regardless of their talents and ambitions. A dropout who has recently "dropped back in" describes how much employers value high school diplomas for all their employees. Interviews with employers show the truth of her words. A GED instructor describes the importance of a diploma. His advice is reinforced by a hard-hitting interview with a now-successful student who returned to school after realizing he could not survive without a diploma. A Cambridge Educational Production.One 30-minute video. This four-part video shows young adults how to successfully seek out financing for higher education.The first section deals with the myths and realities of financial aid, emphasizing that the majority of college students receive some sort of financial assistance. The second and third sections discuss different types of financial aid including private scholarships federal grants, loans, and work-study programs.The final section demonstrates the need for financial aid planning at all stages and stresses the importance of family involvement, since need-based programs require family income and asset statements. A Cambridge Educational Production.One 30-minute video and an adapted version of the Cambridge Financial Aid Planner. This two-part video series follows Jeff, an elementary school student, on his adventures through the library. Using an entertaining and high-interest approach, Jeff meets a gorilla on the way to the card catalog, and finds a few extra surprises along his path. The primary purpose of both programs is to show elementary students that libraries are interesting, helpful, and fun! (Grades 2-5.) A Meridian Production. This video series provides comprehensive preparation for taking the ACT in two entertaining programs that have been updated to reflect the changes in the ACT Test. Part I begins with a dramatization of the worst ACT test taking experience in history. This video goes on to show how to avoid the pitfalls of standardized tests, presents specific test-taking strategies, and illustrates how to overcome test-taking anxiety (performance anxiety). This first part also explains each section of the test, time limits, and scoring. Common student questions are answered concisely, including "Should I guess?" "What do I do if I run out of time?" and "What should I do to prepare myself for the ACT?" Part II discusses the topics covered in sections of the ACT. One 20-minute video each and a 501-page copy of Barron's How to Prepare for the ACT. A Cambridge Educational Production. Help students fight clutter and forgetfulness with this video-and-poster teaching kit. The entertaining video demonstrates the benefits of good organization skills and how to develop them, guiding viewers toward success in school and the professional world. Highlighting key points from the video, the six-poster set provides powerful visual support as students learn the lessons of self-management. Poster set and video are available separately. Correlates to National Standards for Family and Consumer Sciences, National Education Technology Standards, and Standards for the English Language Arts. A Cambridge Educational Product. One 23-minute video and six 17" x 22" laminated posters. For many students, the mere thought of taking a test sends adrenaline running throughout their bodies, brings perspiration to their brows, and causes them to suddenly forget everything they have learned. These humorous and informative videos teach students the art of stress-free test-taking. Students learn how to put test-taking into its proper perspective and realize that although tests are important, they are simply a way to measure one's knowledge of a subject. Reading and taking notes becomes easier, more effective, and less time-consuming as students learn how to find key facts and ideas. Study sessions become more efficient as students learn tips for condensing information into memorable formats and the effectiveness of frequently referring to the condensed versions. These important lessons entertain busy, lazy, eager, and reluctant students as they learn to apply the skills that last a lifetime.A Cambridge Educational Production. These two full-motion video programs utilize humor and effective communication techniques to show young adults how to be better students, enjoy higher test scores, and increase their self-esteem.A Cambridge Educational Production. Using engaging characters, this three-part series covers preparing a book report, searching by subject or title on the computerized card catalog, and researching the subject of the history of books. A Meridian Production. It's about closing the achievement gap and implementing best practices.It's about raising expectations and lowering barriers.It's about a heart-to-heart partnership of educators and parents.Isn't it about time to start some honest discussions in your community?Learn more about the unintended consequences of educational tracking in public schools. See innovative model solutions for bringing these students back onto the college track with this timely three-part series. Hosted by Emmy Award-winner Andre Braugher, The College Track takes a penetrating look at the barriers to college faced by many students and showcases public schools and communities that are succeeding in dismantling those barriers.Additional content includes a 20-minute overview of the series and excerpts from interviews with leading scholars and administrators covering key issues of equity and access to higher education.These stories and examples will help you establish or enhance an all-around winning relationship between your educational community and the public it serves.An educator's guide and a community planning guide are included. 3-part series, 57 minutes each. On-demand English subtitles. Can be viewed using a DVD player or computer DVD-ROM drive.